Ok, where were we? If you missed it, check out Day One before you read this post. When we got to exchange 24, we had the opportunity to shower and sleep indoors in the gym. I went straight for the gym floor, busted out the sleeping bag, and laid down for a while. I think I might have slept for about an hour, but I'm not sure that it was valid sleep. I had too many things on my mind, like making sure we'd be up and ready to run in time for the van switch. I didn't know where everyone was sleeping or how to find them fast because we'd split up in the crowded sleeping area. When I couldn't let myself sleep anymore around 3 am, I went to shower. It was great to have showers, but they were the big open HS gym showers where everyone can see you. Call me weird, but it's a touch out of my comfort zone. I showered anyway, dried quickly because I was chilled, and got back into clean running clothes. I found coffee as I headed out (yay free coffee!) and set off to put my things in the van and to call van 2. A little later I started waking up the team and everyone got ready pretty quickly. I was very amused at the exchange volunteers because they kept 'shhhhhhhing' everyone for night hours. Runners would come in cheering for the exchange and they would say 'shhhhhhh.' Then the whole group would say 'shhhhhhh.' It happened over and over and made me laugh. Van 2 team mates found us and soon after Amy came into the exchange, doing great and ahead of pace. Kim set off and Van 1 was back to running! Kim only had 3.3 miles so we had to head to the next exchange quickly. She handed off to Helen, who had the long run of our third leg at 8 miles. I got ready, chose a tank with arm warmers for that mid-weight warmth, and headed to the exchange to find they were extending the 'night' hours for fog. I went back for my night gear but forgot my LED backlight. Three people were coming to me with LEDs just as Helen was coming in, and Brandon got one to me first. I dropped my warm ups and off I went into the vineyards. Helen teased me because even though I was always at the exchange I never seemed ready. It was so true, I kept having something happen (tight on time, not calling our number in the dark, no LED) that made me feel so last minute. I'll have to remember that next time. That said, I always went off running right away when she came in, ready or not. I had the most awesome third leg, 3.3 miles through vineyards in the cool morning. There were a few rolling hills but nothing hard, and I saw lots of grapes on vines and people harvesting grapes in the early morning. I passed quite a few runners on this leg and came in ahead of pace too. 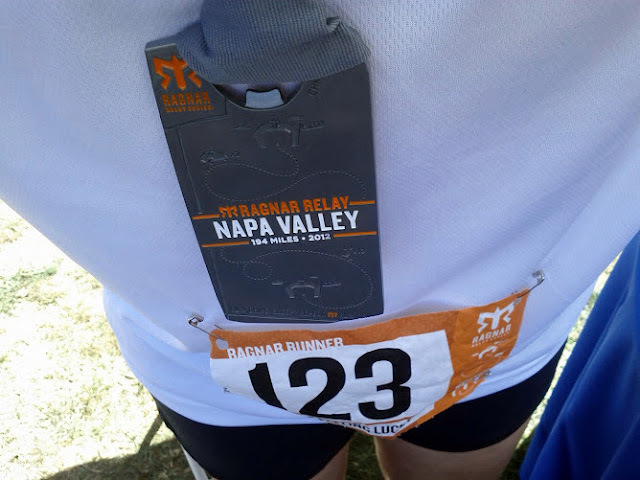 Success on the my last run of Ragnar Napa! Yes, I look weird in the outfit with all the night gear...but look at me go! By this point people were tired and funny. While waiting on Julie to come in from her run, we had fun taking jumping photos. Jumping because he's ready to run! Brandon launching himself in front of the exchange sign. Julie came rolling in from her last leg and Eddie was off, only one runner left after him for our van. Even more fun? We were making up time and catching other runners. Kevin headed out on his last leg and that was the end of the van 1 running adventure. Knowing that we didn't have to meet Kevin with the next runner, we went on a much-needed Starbucks run. We managed to get coffee for everyone including Kevin, plus an extra Chai Latte that someone ordered by accident. Coffee win. We even made it to the next exchange before Kevin to greet him with his coffee. The only big downfall of Kevin's run is that he spent a couple of minutes (it felt like forever) waiting to cross the street right at the end of his leg before he could finish. We finished running! What's next? Van 1 headed for downtown Napa for breakfast at a cute place called the ABC Cafe. Fantastic food, pretty good service, and the perfect location to allow us to walk around for a bit after eating. I scored a vanilla milkshake for my sore throat before we headed out, and we visited Napa Running Company. They had so much of the new Oiselle Fall 12 line and a nice window display, I had a great time checking it all out and chatting with the store employees. Next stop, the finish line. Van 2 decided to run the whole last mile together, and we met them shortly before the finish line to run across. It was intensely hot when we got to the finish in Calistoga, so much hotter than when we were downtown. 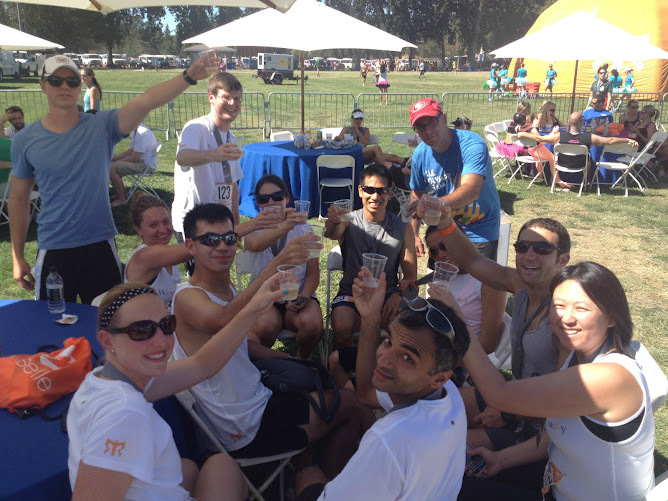 At 27:39 total time, Team We're Feeling Lucky crossed the finish line of Ragnar Napa! We collected our medals and went off to celebrate. There were quite a few fun finish line activities. We sat in the shade of the umbrella tables and enjoyed our wine tasting which was Mumm sparkling. After that we wandered through the freebie stations to get Clif Shot Bloks, Clif bars, and a few different sport drink samples. We enjoyed finish line beer, and after that people were ready to head out. The team toasted our run and also my Ragnar planning work, which was super sweet. I had a lot of fun doing it and I'm so happy I was able to meet so many new people that I may otherwise not have crossed paths with. With that, we end our Ragnar Napa experience. I can't wait to do another relay! For the final part of the report, here are a few details on logistics. Packet Pick-Up. We received race info, bibs, and shirts at the start line so it was very easy. We only had to arrive about an hour early, and because of the staggered start there were no crazy lines. They had organized tents set up, one tent per action item, and we went smoothly from one tent to the next. The shirts are super cute, and they let us exchange sizes at the finish for the ones that didn't fit well. Overall I was impressed with the ease of pick-up. The course. Running from SF to Napa Valley was gorgeous in parts and boring in other parts. There was a variety of terrain and scenery, from vineyards to the Golden Gate Bridge to flat country roads. I enjoyed all of my run routes for the most part. The course is all road and no dirt trail. Ragnar did a great job of marking turns and I didn't have any trouble following at all, although I knew my route pretty well before heading out just in case. We had one runner get lost but she quickly found her way back on course and I don't have detail on how it happened. The support. The volunteers along the Ragnar course did a pretty good job. Some exchanges were great about calling out numbers but other volunteers sat along the side and didn't pay much attention. When they extended night hours, I went back for all of my night gear like a good little Ragnarian but some people managed to start without any night gear and the volunteer didn't seem to notice. 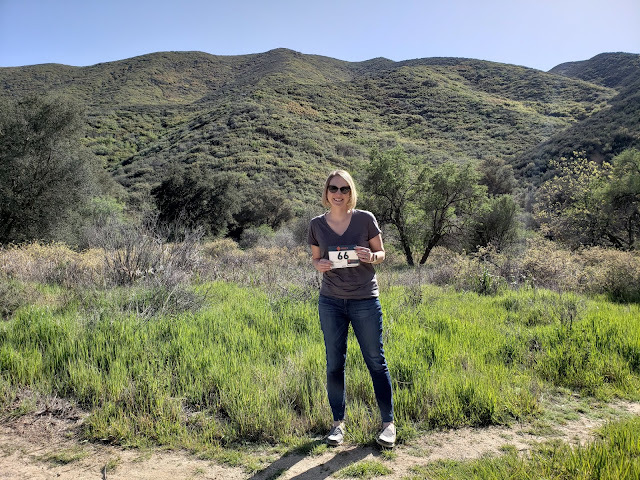 I'm not sure about all of the legs, but Helen's 8 mile leg was scheduled to have 2 water stops (during a no van support section) and it only had one. The Finish Line. The finish line had free sport drinks, Clif Bars, and water but no other free food. That said, there was plenty of food and beer to purchase. They had a big tent to sell Ragnar merchandise, but I didn't actually go in to check it out. I thought they had a well set up finish line and we enjoyed hanging out there. Yes yes loved it! I want to do one with you and Heather! 27:39...200 miles..that works out to 8:20 miles! Is that right? If so you guys were FAST. Technically 194, but still fast! In one week I will be running my first leg of my first relay. I am so nervous but so excited! So much fun! 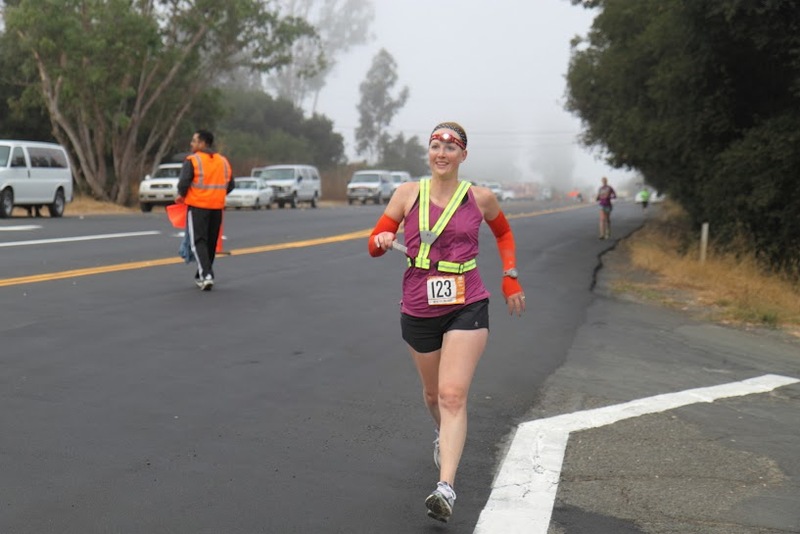 I LOVE that photo of you running in the fog!! So pretty!